My childhood memories bring me back to Bečej, the place where I grew up and lived until my mid-thirties. That’s also where my sports beginnings are: until the fifth grade I was always playing footballs with boys. Some things in football never change: when you play amongst men you give yourself to it 150 percent. I have always loved being in nature and I spent a lot of time being a scout. I used to spend weekends and holidays in Čurug, where my grandparents come from. As a child from a town, I kept discovering different ways of village life, as well as the beauty of nature. I learned that you could make a living off the land, from farming. My grandpa used to say: ‘You can only sell land once.’ That means that once you sell it, it is highly unlikely you would buy it ever again. I would usually come to my grandparents’ on Friday afternoons and my granny used to reprimand me for going to the stables first to pet the cow and the horse, and only then coming into the house. I loved the contact with animals, the contact that most children nowadays are lacking. There is nothing healthier than fresh, warm, just skimmed milk. These days I visit Čurug with my daughter and her adventures there take me back to my childhood. We used to have far less fears than today’s children. We were safe in the street: we could run, ride bikes, roller skate, sleigh, even cross the road without fear of cars. We enjoyed ourselves more than children today, who spend their time in front of computers inside the house. We used to spend time together – no one wanted to be home alone. I remember, with great fondness, all the so-called work actions organized by the school, when we would go to harvest peppers or corn manually in order to earn some money for our school trips. The amount of money didn’t matter, but the fact that you earned something and contributed to the community. That was important back then, that you bear a part of responsibility for your own future. The time spent together during those work actions is unforgettable and I wish I could get it back. While I was in the primary school, I used to work in my mom’s company in order to earn some money to fulfil my wishes during summer holidays. Of course, my parents would add some extra money, sometimes even more than I actually earned. But it was important that I learned to understand the value of money and how hard it was to earn it, the same money you would spend in no time. My dad’s aunt worked in a bank and I found it very appealing. I liked the way she did her job behind the counter, how polite and nice she was to people. I envisioned that I would do the same job once I grew up. What I didn’t know back then was that office work wouldn’t be dynamic enough for me. I grew up in a small community, meaning that many things weren’t easily accessible. Children from working class couldn’t find their place in the A team, nor enter higher leagues on sports competitions. Nothing has changed: rich children still have privileges regardless of their talent. I used to train basketball and when I was about to start high school I should have played in the A team. But that meant that I would take place of an important official’s child, so they thought it was much easier to stop my sports career. My generation was in a way a guinea pig of the education system back then, we were the first generation that didn’t go to the last two grades of primary school, but transferred directly to high school. There was no entrance exam, so the school that you could enrol depended solely on the total average of your grades. In my case it meant that I could only enrol the Secondary School of Commerce, the course in trading. Then, same as now, I didn’t want to use any of the privileges. The basketball club I was playing for could help me to enrol the same secondary school, but a better course, that in economics. Still, even back then I already had a policy of fighting my own battles. During secondary school, I was reading five to six books a week, primarily because I was eager to learn, but also because it was my harbour, my safe place I could go to. I read every day and I still do – I never travel without a book. I was never a top student, but I learnt how to study to understand the matter rather than to learn it by heart. I already got the good base in primary school so I didn’t have to spend much time studying, except for the subject called Marxism. We were all adjusting to a new school curriculum, new subjects and new friends. We were searching for ourselves and discovering who we were, thinking about what future holds for us, wondering why we studied subjects like Art and Music and if we were ever going to need them in our lives. Today I feel grateful for everything I have learnt, if for nothing else then at least to feel good about myself when I can answer that one tricky question in a crossword. My aunt encouraged me to take up English lessons when I was in higher grades of elementary school. Thanks to that, now I can manage everywhere in the world. If I lack the right word, I use two shorter sentences instead, to get my message across. There isn’t such thing as unnecessary knowledge and the knowledge of a language is priceless. We had Hungarian lessons in primary school, but I didn’t show much enthusiasm until the fifth or sixth grade. I remember it was winter and I was coming back from a scouts’ meeting when an elderly lady stopped me and started explaining something in Hungarian. I couldn’t understand her. It took me fifteen minutes to realize that she was asking me to help her cross the slippery street. That motivated me and the very next day at school I started learning Hungarian much more seriously. Today Hungarian is popular because of the passport – people learn it in order to get something, but we learned it because we really wanted to be able to communicate in that language. I remember that after my first TV appearance one of my ex-teachers asked me: ‘Where did you learn to express yourself in such a nice way?’ I smiled: ‘Isn’t that to be expected after eleven years of education?’ Same as many teenage students today, I also didn’t always understand the importance of general education. Soon I found myself in many situations where everything I have learnt proved useful. We were young, eager to feel what life had to offer, it was our time, but it was also the beginning of the nineties. Those were the years of war, crisis and poverty. I remember well going out in that period: we would have just enough money for a cup of tea and a token for a game of pool. We were trying to play as well as we could at a pool table because the unwritten rule was that as long as you were winning, you stayed at the table. Whether you would play one game of pool or ten depended on how well you played. The same rule remains true for me even today: the more matches I play, the longer I play the longer I get to stay at the table. I have always wanted something more than the rest of my generation. I wanted success in life. From an early age I was competing with my cousin: could I as a girl do everything he can? I wasn’t thinking whether some jobs are typically male or female, I tried to assert myself in every possible way. I don’t perceive jobs on male or female even to this day, but as those I like or don’t like doing. 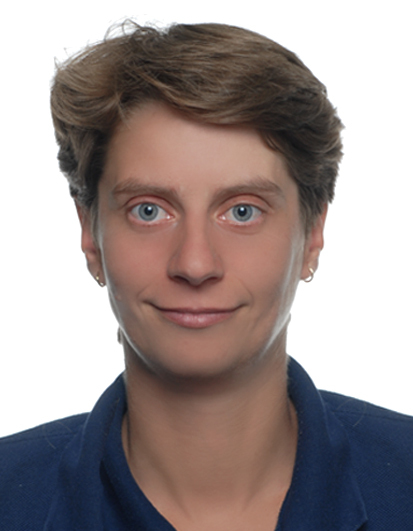 Some people say: ‘You know, it isn’t exactly a female job.’ I usually answer: ‘Well, maybe it isn’t, but it gives me satisfaction and that’s what matters.’ It doesn’t matter whether you do science, sports or music. What matters is that you are dedicated to something. Perhaps the result won’t be visible, but your inner feeling cannot be compensated by anything. Satisfaction that you get from the fact that you are involved in something is success in itself. After finishing secondary school, I tried to enrol the College of Informatics, but I wasn’t well prepared for the entrance exam. Perhaps I would have really ended up in a bank working as a clerk. Since I didn’t get into a university immediately, I started working and it lasted for a year or two. During all that time I was saving up to continue my education and was preparing for the entrance exam in maths. I stopped doing sports when I was in my first year of high school, so I became really involved with scouts. At the age of eighteen, I was a scout’s leader of younger scouts who I took to competitions. That period was filled with many weekend trips. We would pack our rucksacks, sleeping bags and tents and then go on a two-day hike in Fruška Gora. I was in nature whenever there was an opportunity for it. When I started university, I stopped working and moved to Novi Sad. However, my studies weren’t going as smoothly as I thought, so I decided to start working again and financially support myself. I failed one year at university, but I wasn’t disappointed. As long as you are trying to do something in your life, it could only be more or less successful, but it could never be unsuccessful, due to the fact that you have tried. Failure is if you do something because of others. I found a summer job at a carpenter’s who had just set up his company and who was my mom’s colleague. First I was doing administrative work, but I soon ended up in a workshop because sitting in an office was not in my nature. When I was younger, I never thought about consequences. What can happen if I jump from the tree? When a person doesn’t think, everything goes the direction you didn’t’ want it to go. It all happened in a moment when I was not paying attention, when I thought I was stronger than anything else. It did go wrong, but my mind remained sound. If the injury at work hadn’t happened and left me with a disability, I probably wouldn’t have succeeded as much as I have. I didn’t use to have perseverance as I do now: even when I see that something isn’t going smoothly, I don’t give up until I do it the way I have planned. Time spent in nature and sports activities being high on my list, it all helped enormously with the recovery from the spinal injury that could have been completely tragic otherwise. As long as we are fit, our bodies are able to do things we couldn’t even imagine. My parents came to visit me right before the surgery that would fixate my spine. They told me: ‘We are not going to think why it happened, but we are going to see what we can achieve tomorrow. Keep your head up and we will get over this.’ That attitude was crucial. You could hear laughter and jokes at any time in our home regardless of the condition that I found myself in, at the age of just under twenty-two. And we did get over everything. When you think that the whole world is yours and such a turning point happens, it is very important to deal with it yourself. It doesn’t matter whether you would do it during day or night time, alone or in a company, what matters is that you need to make it clear to yourself what you want at that moment when your life has drastically changed. I wasn’t aware that my spinal injury was so severe, that I might never be able to walk without a walking aid. During one period of my life I used crutches, but my priorities changed when I took up table tennis, and due to many successes that followed I accepted to use the wheelchair as a means to get out there into the world. I met a friend in Melenci who told me about the Paraplegic and Quadriplegic Association of Novi Sad, about their activities, meetings, time they spend together. My mom asked me why I wouldn’t join them. ‘Ok, if you really want me to,’ I said unwillingly. After becoming disabled, the only thing I wanted was to get back to normal life. I didn’t see myself in any kind of group or association, I saw myself out in the world. When I add it all up, I can do everything. Perhaps I can’t go the fifth floor without a lift, but I could make the fifth floor come down to me. It was very hard for me when I was told at the doctor’s that I should retire. I was only 23 back then. It was so humiliating to retire at such a young age. I was a bit angry with everyone and I tried to prove that a person with a disability could function normally. Soon I started going to the Association and I took up sports. 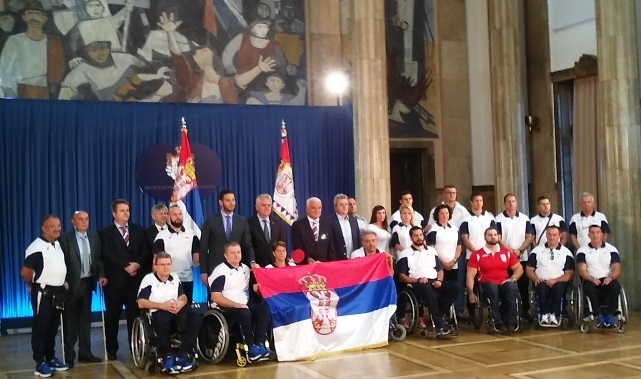 I took part in the National and Provincial Games, in meetings where paraplegic and quadriplegic athletes compete in various disciplines: four athletic disciplines, shooting and darts; men also competed in chess. With those events my sports story began. 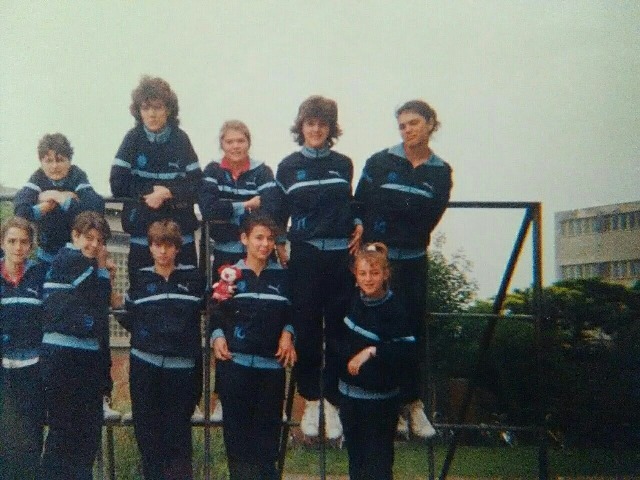 My first competition was in Obrenovac, where I went to complete the team because there weren’t enough women. I won three gold and one bronze medal. It was a very good attempt to see where I was. There was no doubt that I would continue doing sports and I chose basketball because I used to train it earlier. I remember that it was impossible for me to hit the hoop during the first training until I positioned myself on the free shots line. ‘There’s no way you could do it from there,’ they told me, but my ball went straight through the hoop without even touching the rim. I realised that I shouldn’t have come close to the basket, but throw a ball from the distance. However, there was no future for me in basketball, because I was the only woman back then who played it. 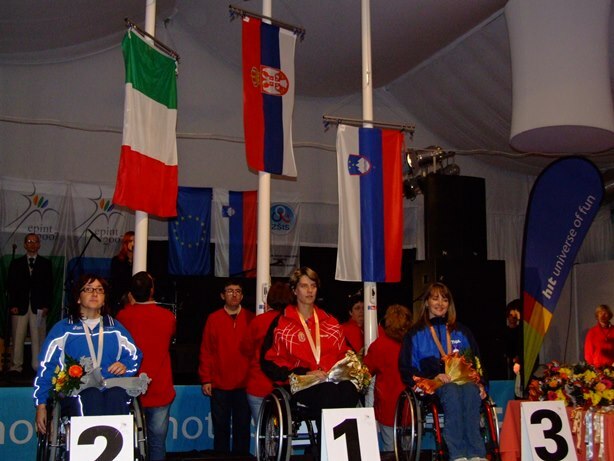 When I found out that Novi Sad should be the host of the National Games for Paraplegics and Quadriplegics, I started practising table tennis once a week so we could show ourselves in the best light. What was the result? Both teams, the male led by Zlatko Kesler, and the female one, won the first place. That’s when I started considering playing table tennis in a more professional way. Soon after the Games there was a tournament in Belgrade where I won again. There were many people who were playing table tennis longer than me, I could hardly hold the racket, but I kept winning. Since there weren’t enough women in the team, I was asked by Zlatko Kesler if I would like to start training table tennis and I said yes. In the beginning, I used to combine table tennis and basketball practice, but to some male basketball players (because of their ego) it was unacceptable that a woman was part of their team. Miroslav Homa was my support in the basketball court, but the trainings looked completely different when he wasn’t around. ‘Take a racket and move to the room where they play table tennis,’ I told myself and with those thoughts I left the basketball court. After eight months of training table tennis, a year at most, I asked Zlatko Kesler how long it would take me to be at the top. He said: ‘It’s not as easy as you might think.’ His response made me become better than I could ever have been hadn’t he told me that. Zlatko’s words triggered my stubbornness and made me even more determined, though he says he doesn’t remember saying it to me. It’s not always about the gold medal; there are also competitions that are crucial for the changes that happen at the level of consciousness. 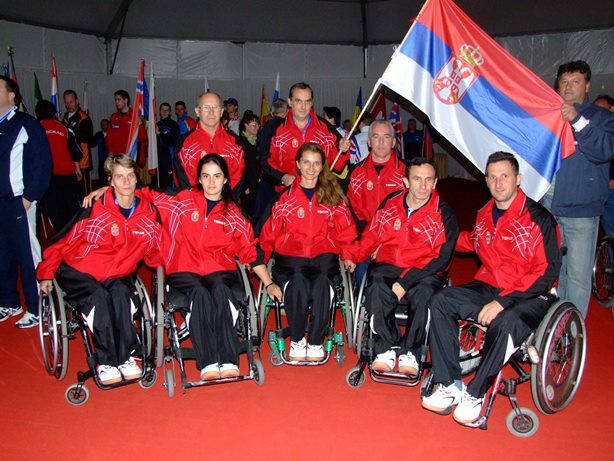 Nada Matić and I won the first team medal in Slovenia in 2004. Next year I was registered for the European Championship, but I didn’t have a partner because Nada got pregnant and the other girls were not good enough to accompany me. I went to a big competition for the first time as the youngest in the team, together with Zlatko Kesler and Ilija Đurasinović. They all looked after me so well and taught me the finesses, not only in sports, but in life generally. For instance, how do you eat seafood or how do you ride in a gondola. Everything that I had experienced there was crucial for me to change and expand my understanding of certain things. That year it was the first time for me to swim in the sea ever since I ended up in a wheel chair. The referees carried me into the sea. When you politely ask something, everything is possible. I realized that I would also help others to find a solution because the solution is always there, even before a problem occurs. I was highly motivated and felt positive about things. Zlatko and Ilija won the gold medal at the championship, our flag was being raised, and our then anthem Hej Sloveni was playing. That is the moment that you are living for, the moment you want to experience again. After two years, I had the honour to experience the same. There was a period when I suddenly improved a lot and started playing in semi-finals and qualified for finals. Ever since I started playing, I wanted to represent my country at the Paralympics. That was my dream. When I won the gold medal at the European Championship, I was asked to describe how I felt. I said: ‘I don’t know,’ because for me it wasn’t just the gold medal, it was my ticket to Beijing, a ticket for the Paralympics. Some medals are not just medals. But it is always priceless to be on the medal stand and listen to your anthem. I met my husband at the table tennis tournament in Belgrade. He accompanied a friend who is a person with a disability. When we met, I didn’t see myself in a role of a wife or a mother. Sport was my priority and everything else could wait. Still, from spending some casual time together, we moved to starting a family. That happened largely because of him being patient with me. I won the gold medal at the European Championship in Genoa, Italy, in 2009. Since I was using some supplements, I asked our fitness trainer, who also finished a medical school, how much those supplements might affect my period. ‘Could they have postponed my period?’ I asked. ‘They shouldn’t have, but the stress might have.’ ‘Ok, I’ll check it when I come back from the competition.’ Somehow I had a feeling that I was pregnant. The feeling when you think about it that in two days you actually won two gold medals is priceless. I had an easy pregnancy, partially because of the attitude of my doctor. When I found out I was pregnant I asked him: ‘What should I do now, how should I behave? I am after all a pregnant woman with a disability, does that change anything?’ The doctor said: ‘Your pregnancy is good, which means that your body is healthy.’ ‘Ok, but my situation differs a bit… Am I allowed to travel, sunbathe, swim?’ ‘You can do everything. You are not ill so stop behaving as if you were.’ And so I did. I was a sparring partner till I was six months pregnant. I travelled to places where we had our sports boot camps. My husband and I knew that we were expecting a girl, but we didn’t tell it to anyone else. At first, my father said: ‘I wish it was a boy… But no, we already have two boys, let it be a girl this time.’ My husband let me choose the name of our girl and I have chosen Dragana. We were so happy that she was coming and the name itself represented everything that was happening to us while expecting her. This way we were also keeping memories of some friends we lost. I had a c-section as planned, under general anaesthesia. Dragana was a birthday present for my dad, she was born a day before his birthday. The two of them have a great time when they are together. Five months after the delivery, I started training again and a month later the three of us travelled together to my first tournament. My daughter has been in the practice room with me from day one. It wasn’t always easy after she was born, because I had to depend on others and I wasn’t used to that. I was used to being independent. I had psychological crisis when I couldn’t be as independent as I wanted to be, but in every moment I had the support of my husband, his mother and my parents. What drove away any doubt I had were the words from a midwife who had known me since I was a child. She said: ‘You can do anything all other moms can do. The only question is whether you want it or not. You’ll get over this.’ My daughter’s happiness gives me the strength for all of my plans. There are many things I wouldn’t have done if I hadn’t promised her I would. Before my trip to London, Dragana was three. I asked her: ‘What would you like mommy to bring you?’ She didn’t ask for a toy, she said: ‘A medal.’ I was losing in the semi-finals 2:1. I lost the third set quickly, but I quickly won the forth one because I told myself: ‘You promised her and this would be the first time in your life not to keep your promise.’ That gave me that extra strength to make it to the finals where I knew one of the medals was waiting for me to take it back home. Every time I go to competitions Dragana wishes something, but she does it in such a modest way that it motivates me even more to accomplish big things. I have reached the Olympic top thanks to her, because I try to do something other moms can’t do while I know that those moms can do something I can’t. I compensate. Dragana is proud to have me as her mom. People watch me on TV, approach me in the street, and to her I am a mom every single second, every single day. She made me aware of some traits in me I didn’t even know existed. She herself helps me to deal with her. She understands that I can’t accompany her everywhere and that I don’t have as much time as she wishes I would, but there is always time dedicated only to her. If she wants me to go through hoops, it doesn’t mean I would do it, but I might consider it. I think we should let our children find their own place in this world. A parent is there to be a support and not somebody who should do everything instead of a child. When Dragana goes training, swimming or ice-skating, I insist that her dad takes her because I don’t want her trainers to build an image of her, the image based on the impact I might have. If we serve everything to our children on a silver platter, we risk raising criminals and bullies who are used to grabbing things instead of creating something worthy. Over the last ten years, there has been a huge increase in number of non-governmental organizations that deal with people with disabilities. They have been doing things in a wrong way, at the wrong time, and with a wrong approach. The sports success that we have been building for years has been misused and abused by some organizations. They say: ‘You see how successful they are and you still haven’t provided a more accessible city for them in terms of ramps and personal assistance.’ It was never my goal to get anything from the state. There are many organizations dealing with people like me without actually asking what we really need. I’ve never had a personal assistant because I don’t need one. I don’t know if there is a ramp in front of the main post office, but I know that there are post offices with thresholds of only 2 cm and with parking spaces. I know that there are solutions, we just need to find them. My biggest problem when I became disabled was lack of information. I was wandering for years before I took up sports because I didn’t know what possibilities for a disabled person there were, where I could go, which locations were accessible to me, which organizations there were and what they did. 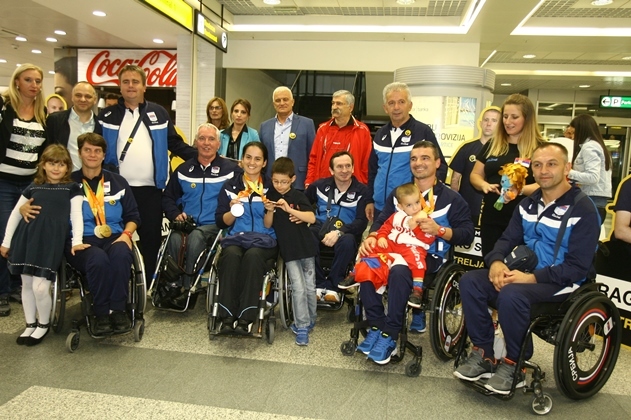 Our sports achievements are our extra ticket, they give us an opportunity to appear in the media and be heard, so that the opinion about the disabled people would start changing. What I personally enjoy most is spending time with children because they are the best ambassadors. They are honest; they greet us with open hearts and show us in the best light to their parents and other adults. That, in and by itself, is priceless. I found myself more and more in situations where I passed parts of my experience on to those children, I motivated them and answered their questions and doubts. As much as I enjoyed those meetings, at the same time they made me more aware of the huge responsibility that I had because children absorbed everything they had heard. Soon after I had become disabled, I heard a girl asking her mom: ‘Why is this lady in a wheelchair?’ The lady answered without too much thinking: ‘Because she didn’t listen to her mom.’ So every time that little girl was naughty she would ask her mom if she would end up in a wheelchair. We must be careful what we say to our children. I can’t point at something that happened and say: ‘It was hard. Every moment in our lives can be difficult, but if the next day you look at what happened yesterday, your perspective changes. Today you get a flat tyre on a highway, and think it’s a catastrophe, but then tomorrow you might laugh at it. It’s relative. It was tough when, back in Rio, we found out that I was playing against the Chinese Zhou Ying. It was one of those to-be-or-no-to-be moments. The next day I said to myself: ‘It is what it is. It’s not that you can avoid it.’ Right before the match I wasn’t nervous or anxious, I didn’t have any stage fright: either it was going to be an absolute blast or an absolute catastrophe. There was nothing in between. After the match I laughed at everything I’d been through because I won smoothly 3:0, so at the end it was her who was wondering what on earth had just happened. So was this a tough moment if you look at the outcome? There are no tough moments unless you really want to try to explain to everyone how difficult everything that‘s happening to you is. In that case it’s going to be hard. We are all our worst enemies. There aren’t any difficult moments, only turning points. My life is very different from the one I used to imagine. Starting from some existential questions: with my own hands and a racket I managed to get a flat. In the past I would have thought it was impossible. Even a small flat may seem like a huge one just because it’s all yours. Building a home is an accomplishment. In many ways I try to thank everyone who supported me in my sports achievements. Sometimes to express my gratitude I make them dinner with a lot of love and then we all eat and spend time together. There are things money can buy, but the most important things can’t be bought. I wish to travel around Europe with my family because my daughter would like to visit all the places I competed in. We probably won’t be able to do it in one go, perhaps I won’t even remember all the places I played in. I would like to take her to Spain first because she was only six months old when she was there. I wish that once again I could stand on my feet for at least a day. It could be done. If I had more time, I would go to the rehabilitation centre, wear a splint, exercise on rehabilitation parallel bars, but it still remains one of those ‘wish-upon-a star’ things. I actually live a much more fulfilling life than I would have lived if the accident hadn’t happened. Before the accident I wasn’t that persistent, determined and stubborn, not at all. Now, it is going to be either my way or no way at all. 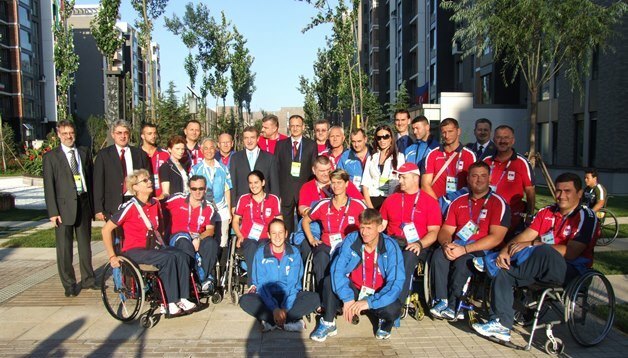 After the Paralympics in Rio, my dreams about getting autographs or a handshake from famous athletes turned into reality. At the same time, I was starting to be aware of my own accomplishments. When I played basketball, the Partizan basketball club, with Žarko Paspalj, Đorđević and Divac, was number one in Europe. Some of them I meet nowadays at meetings and gatherings. The only thing I still didn’t get is the chance to meet Novak Đoković. Even to this day I am not aware of how much I have accomplished, but when an athlete I used to support in world championships, approaches me asking for my autograph or a handshake, then I start to realize it. All athletes have something in common, one goal and aspiration and that is to bring joy to people in our country. Our success isn’t only ours, but it belongs to the whole country, even to the poorest one who shares our happiness. People recognize me and approach me: ‘Can I just touch you?’ I know that they were with me in the court, and that they were going through the same emotions as I did during the finals. If we hadn’t trained hard, we wouldn’t be where we are now. If we didn’t have the conditions we had at SPENS, we wouldn’t be where we are. If we didn’t have a professional team with Zlatko Kesler, Lazar Kurteš, Ilija Đurašinović, Paja Vukadinov, Miodrag Čović, Romana Romanov, if there weren’t all these people, we wouldn’t be where we are. The club Spin that I’ve been training for is the core of our national team. We brought four medals from the Paralympics, and, to my knowledge, that has never happened in any individual sports discipline. The Law on Sports enables us to be financially secured, which provides an additional motivation for people with disabilities to turn to sports. I don’t know how I would name a book about me, nor do I think about it. If it is ever going to be written, I think it would remain untitled. Each reader should give a title according to their own feelings, according to what it was in the book that touched them, that was crucial for them. Think well about every next step you take because you can land on the safe ground, but you can also fall in a pit very hard to get out of. When you look too far ahead you stumble upon most ordinary things. When you look at the most ordinary things, that’s how you reach the top.